Illuminated and non-illuminated, raised relief globes, and more. Excellent reference tool for children and adults. Some globes are also offered in Spanish and French languages. 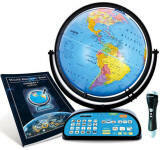 Premier Globe with Atlas Treasury Floor Stand Geographer 12"
Day / Night 12" Globe Terenne Illuminated Wonder Blue 4.3"
Our Shopping Cart - holds a Secure Web Server Certificate by McAfee and offers PayPal and major credit cards for your convenience.